Independent.ie NewsdeskAngel Di Maria curled in a stoppage-time equaliser as Paris St Germain twice came from behind to force a 2-2 draw at home to Napoli in a pulsating Champions League tie on Wednesday. Kevin Palmer Former Manchester United assistant boss Carlos Queiroz has claimed the transfer policy of the Old Trafford giants has been exposed since Alex Ferguson retired as the club’s manager. Kevin Palmer Manchester City appear to be closing in on their latest big money capture as reports in Germany claim they have agreed a massive £50.4m (€70m) deal to sign Wolfsburg forward Kevin De Bruyne. Chris Bascombe A brace from Memphis Depay and a goal at the death sealed a 3-1 win for Van Gaal's side over Club Brugge ahead of the return leg. Here is what we learned on the night. Declan Whooley Angel Di Maria's replacement at Manchester United may come from the Paris Saint Germain according to reports in the Spanish press. Kevin Palmer Barcelona's new technical secretary Robert Fernandez has admitted Pedro could be about to leave his club, as Manchester United prepare to swoop for the Spanish forward. Benfica winger Nicolás Gaitán will play his final game for the club before completing a €30m move to Manchester United next week, according to The Metro. Kevin Palmer Manchester United legend Rio Ferdinand has suggested that Angel Di Maria will live to regret his failure to make the most of his record breaking move to Old Trafford. Mark Ogden There was a certain irony in Angel Di Maria's decision not to board a flight from Buenos Aires to San Francisco to join the Manchester United squad in the United States 10 days ago. Independent.ie Newsdesk PSG captain Thiago Silva says that Angel Di Maria will be making a step-up by joining the Ligue 1 outfit. Angel di Maria looks set to have a medical with Paris St Germain over the next 24 hours after Manchester United agreed to sell the midfielder to the French club for €63m. Simon Rice Manchester United are prepared to make an £86m move for Gareth Bale this summer, according to reports. Kevin Palmer Manchester United manager Louis van Gaal has admitted he does not know where his £59.7m winger Angel Di Maria is hiding out - but it seems he has been located to his homeland of Argentina. Laurent Blanc claims Paris St Germain are close to completing the signing of Manchester United midfielder Angel Di Maria. Kevin Palmer Manchester United are confident that they will sign Barcelona forward Pedro ahead of the new Premier League season, after talks over a deal for the Spanish star edged closer to a conclusion. Manchester United appear ready to cut their losses on record signing Angel Di Maria just 12 months after they splashed £59.7million to bring the Argentinian winger from Real Madrid. 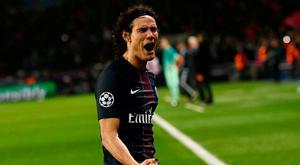 Manchester United are 'desperate' to sign PSG star Edinson Cavani and may still move for the player even if Angel Di Maria's proposed move to the French club falls through. As Di Maria closes in on a move to PSG, we examine five reasons it did not work out at Old Trafford - from injuries to break-ins. Simon Rice Zlatan Ibrahimovic has publicly welcomed Angel Di Maria to PSG, despite the transfer from Manchester United not yet being completed. John Percy Chelsea manager Jose Mourinho will be concerned over Chelsea's form despite their victory over PSG in a penalty shootout in Charlotte. Mark Ogden Angel di Maria has edged closer to a £45 million move to Paris Saint-Germain after failing to board a flight to the United States to join up with Manchester United on their summer tour. Comment: Has Louis van Gaal more money than sense? Declan Whooley In less than 12 months at Old Trafford, manager Louis van Gaal has lightened the club coffers to the tune of €300m. Yet why is there still a degree of uncertainty among sections of the supporters? Jason Burt Paris Saint-Germain believe that Angel Di Maria wants to join them – but they will not sell Edinson Cavani to Manchester United as part of any deal. Mark Ogden Manchester City considered an audacious move for Manchester United winger Angel di Maria before focusing their efforts on the capture of Raheem Sterling from Liverpool. Declan Whooley Angel Di Maria appears unlikely to join his Manchester United colleagues on their pre-season tour of the US as Paris Saint Germain step up their interest in the Argentinian international. Manchester United will continue their spending spree with the signing of Benfica midfielder Nicolas Gaitan. Manchester United are ready to make another move to sign Benfica midfielder Nicolas Gaitan. Callum Davis If you thought Angel Di Maria was finished - think again. Independent.ie Newsdesk Angel Di Maria scored twice and Lionel Messi was in inspired form as Argentina made it into the Copa America final with a 6-1 hammering of Paraguay. Angel Di Maria insists he does not want to leave Manchester United but admits he is at a loss as to why he has fallen out of favour at Old Trafford. Independent.ie Newsdesk A recent poll from Sports Direct has shown who is the most popular Premier League player from a jersey sales point of view, and the winner is somewhat of a surprise. Independent.ie Newsdesk Paris Saint Germain are looking to entice under-performing Manchester United star Angel Di Maria in an €8m loan deal. Manchester United's £60m signing Angel Di Maria has had a number tattooed on his arm. Declan Whooley In a topsy-turvy first season in charge for Louis van Gaal, Manchester United still harbour title aspirations after defeating neighbours City in what has been a roller-coaster campaign. Can you guess which player sells the most shirts in the Premier League? Tom Sheen Despite his poor form on the pitch, British record signing Angel Di Maria continues to be a success off the pitch. Simon Rice Predicting a Manchester United starting XI this season has been near impossible - even manager Louis van Gaal has often appeared perplexed over who he should play. Simon Rice Louis van Gaal has been accused of showing disrespect to his assistant Ryan Giggs and mistreating struggling Manchester United duo Radamel Falcao and Angel Di Maria. Adnan Januzaj has been spending extra time in the gym in an attempt to bulk up and become faster. James Benge Arsenal kept the defence of their FA Cup title on track with a deserved win over Manchester United. James Orr Manchester United will fund a sensational transfer for Real Madrid's Gareth Bale this summer by selling record-signing Angel Di Maria, according to the Daily Express. Tonight in the FA Cup sixth-round, Arsenal travel to long-time rivals Manchester United. Will Man United look to cash in on Angel Di Maria? Declan Whooley Just seven months after joining Manchester United for £59.7m, various newspapers this morning are suggesting that Angel Di Maria may be heading for the exit door. Jason Mellor It was perhaps fitting that a game so distinctly lacking in quality should be decided by an error and provide two major controversies - a refereeing blunder and a spitting competition. Tim Rich Louis van Gaal has warned Manchester United that it will take a year before they see the best from Angel Di Maria and the club's other summer signings. Simon Rice Manchester United pulled off a coup in signing Angel Di Maria, who despite struggling for form since switching to Old Trafford, continues to be considered among the best players on the planet. Paul Wilson Louis van Gaal said he did not much like Manchester United's last home win, 3-1 against Burnley, and he will have liked this one even less. Paul Hirst Jonny Evans admits Manchester United have failed to produce the kind of attractive football their fans have become accustomed to this season. Henry Winter Only when Manchester United rediscovered some of their old DNA, playing with width and passion, did they recover from pending humiliation at Deepdale. Jack Pitt-Brooke The problem for Paris Saint-Germain tonight, as they welcome Chelsea back to the Parc des Princes, is not so much the improvement in Jose Mourinho's side since they met last season, their new recruits and their growing maturity. It is that PSG have got worse. Simon Rice Wayne Rooney has not had a single shot on target in the Premier League in 2015. It covers six Premier League games and 450 minutes of football. Manchester United were described as "long-ball United" by West Ham manager Sam Allardyce after the sides' 1-1 draw at Upton Park on Sunday - an "interpretation" Red Devils boss Louis van Gaal, armed with a dossier of evidence, subsequently insisted was incorrect. What did Radamel Falcao, Wayne Rooney, Robin van Persie and Angel Di Maria contribute? Mark Bryans Manchester United have one of the most expensively assembled attacking units in world football but all is not well for the Old Trafford stars. David Lyons Manchester United are producing an average of only 5.7 chances per game this season. They are 11th in the Premier League statistics table for number of shots at goal per game. Jim White So it was that lightning didn't strike twice. Unlike in September in the reverse fixture, after scoring three goals this time Manchester United managed to see off Leicester City. Tom Sheen Jose Mourinho has revealed that he decided against signing superstars Angel Di Maria and Radamel Falcao in the summer, because it "would have caused an explosion". Have Manchester United's six summer signings lived up to their £150m price tag? 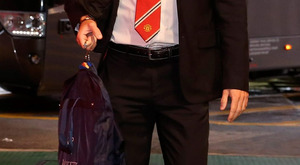 Tom Sheen After 21 Premier League matches in the 2013-14 season, then-Manchester United manager David Moyes had accrued 37 points. Louis van Gaal has the same number of points in his first 21 games as David Moyes - but in many other ways, his side his actually performing worse than last season. These stats don't make good reading for United fans. Henry Winter The passion with which Manchester United celebrated their goals and ultimate victory over the League One's bottom club demonstrated how seriously they are taking the FA Cup. Manchester United midfielder Darren Fletcher hopes the hard-fought 2-0 win over Yeovil will be a game to look back on if Louis van Gaal's side go on to win the FA Cup. Simon Rice Manchester United forward Angel Di Maria has admitted a move to Paris St Germain would have been a "great experience". A Premier League-laden Argentina came from behind to beat an experimental Croatia side 2-1 in their friendly at Upton Park. Would Manchester United be making a mistake in selling Juan Mata? Simon Rice The former Chelsea player only arrived at the club in January but there is uncertainty over where the £37.1m buy fits into a side awash with attacking talents. Gareth Bale's agent has strongly rubbished reports that the Welshman could move to Manchester United. Miguel Delaney LOUIS VAN GAAL has admitted he may have changed Manchester United's formation "too much" in his first 11 Premier League games at the club, but insisted he retains a "clear vision" for the team. Declan Whooley The Premier League campaign looks likely to be a rarity. The two most successful teams in England are destined to be relegated to bit-part players, focusing at best on a Champions League scrap. This kid would put Eamon Dunphy and Gary Neville to shame! Martin Hardy “We will deal with him with a degree of firmness.” So says Manchester United defender Marcos Rojo of his fellow Argentinian Sergio Aguero. Tim Rich Manuel Pellegrini has said he would be interested in signing Steven Gerrard should the Liverpool captain leave Anfield. Ian Rush THE amazing revelation by Steven Gerrard that his future may lay away from Liverpool has come as something of a shock to me. Declan Whooley Ahead of the eagerly anticipated Manchester derby, here are five questions that will be answered when United and City clash at the Etihad. Jack de Menezes Manchester United could face their biggest game of the season so far against Chelsea without their club record signing after Angel Di Maria limped out of their 2-2 draw with West Brom. Manchester United are believed to be ready to reward defender Tyler Blackett with a new contract – worth a ridiculous £50,000-a-week. Paul Hirst Radamel Falcao scored his first goal in English football as Manchester United recorded back-to-back victories for the first time under Louis van Gaal. Declan Whooley Manchester United's on-loan striker Radamel Falcao demonstrated his poacher's instinct to score his first goal for the club against Everton today. Simon Rice Manchester United winger Angel Di Maria has revealed that it is his "dream" to play again in his native Argentina. West Ham manager Sam Allardyce has warned Ravel Morrison his loan spell at Cardiff is his last chance to prove he is worthy of a future at Upton Park. Simon Rice Radamel Falcao is yet to make much of an impact on the pitch for Manchester United, but in terms of shirt sales the Colombian has performed phenomenally. James Orr Sam Allardyce believes that David Moyes should have been handed the same funds for transfers that have been given to current Manchester United manager Louis van Gaal. Wayne Rooney insists the future is bright for Manchester United despite their inconsistent form under manager Louis van Gaal. Louis van Gaal is convinced Manchester United will bounce back from their 5-3 humbling at the hands of Leicester. Tim Rich Roberto Martinez has cast doubt on the Football Association's scheme to reduce the number of non-European Union players in the Premier League. Pete Jenson Liverpool supporters who took one look at the Real Madrid score on Tuesday and feared for their team in the two games the sides will play in late October, early November need not be so concerned. Tom Sheen Cristiano Ronaldo continues to be linked with a sensational return to Manchester United next summer. Tom Sheen Angel Di Maria has promised to do "all that is possible" to live up to Manchester United's famous No 7 shirt. REAL MADRID'S early-season woes deepened when they lost 2-1 at home to La Liga champions Atletico Madrid on Saturday night as substitute Neymar struck twice in Barcelona's 2-0 win against visiting Athletic Bilbao. Ian Herbert Louis Van Gaal told his Manchester United players to consider their game against Queen's Park Rangers as the first match of the season and a new beginning - and they responded yesterday with the first win of the season and four goals. Ian Winrow Harry Redknapp has condemned Financial Fair Play regulations, insisting the current arrangements will only widen the gap between the leading clubs and the rest of the Premier League. James Orr Barcelona midfielder Xavi rejected the chance to sign for Manchester United over the summer, according to reports in Spain. Jamie Holland LOUIS VAN GAAL looks set to unleash the full might of his £150m summer spending spree against QPR on Sunday as the Dutchman searches for his first victory as Manchester United manager. Ian Herbert Every Premier League club has refused to reveal to the public the full details of fees paid between clubs and to agents during transfer windows. Angel Di Maria has claimed his former club Real Madrid put pressure on Argentina not to play him in the World Cup final in another bitter chapter in his departure from the Spanish giants. Former Manchester United star Paul Parker has criticised the form of Wayne Rooney, calling for the striker to be dropped when Robin van Persie returns to full fitness. Is this how Man United could line up with Falcao? Declan Whooley Radamel Falcao was the big talking point on transfer deadline day, but just how will Manchester United line-up with their raft of summer signings? Liam Kelly David Meyler is not intimidated by the big name opponents he will face in the Premier League after a cash-splash bonanza by the richest clubs in England. Louis van Gaal's problems mounted at Turf Moor as Angel di Maria hobbled off injured in Manchester United's uninspiring 0-0 draw with Burnley. 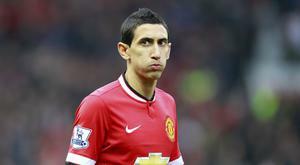 Louis van Gaal's decision to replace record signing Angel Di Maria with Anderson was met with widespread criticism and ridicule. Fernando Torres has touched down in Italy and formalised his two year loan move to AC Milan. Chelsea are in talks to sign Loic Remy from Queens Park Rangers after finally cutting their losses and allowing Fernando Torres to join AC Milan on a two-year deal for free to end one of the most disastrous moves in Premier League history. Manchester United are set to bolster squad with the signing of Daley Blind after the club agreed a £14 million fee with Ajax for the versatile 24-year-old. Ian Herbert When football's vice really starts to grip, Louis van Gaal does not stick so stoically to his dugout, in that way to which we are becoming accustomed. Jason Burt and Oliver Brown Fernando Torres has agreed a two-year deal to join AC Milan and finally end one of the most disastrous moves in Premier League history. Burnley manager Sean Dyche believes it will take time for Manchester United to adapt to Louis van Gaal's 3-5-2 formation because it is so "radical." Declan Whooley John Giles believes that Angel Di Maria is not the type of player Manchester United need and that Xabi Alonso would make more of an impact in the struggling team. 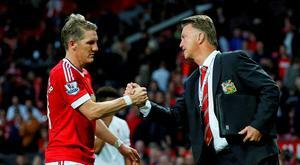 James Orr United have not clicked so far under Louis van Gaal. Here are five reasons why it may be another difficult year for Manchester United? Is Louis van Gaal beginning to sound like David Moyes? Simon Rice Following Manchester United's humiliating defeat to MK Dons, Louis van Gaal made a rather strange comment. Ian Herbert Manchester United may attempt to use a makeweight in any deal to sign Arturo Vidal from Juventus, with their concerns about the player's fitness likely to make a straight cash deal difficult to seal. Angel Di Maria has said he is "absolutely delighted" to have joined Manchester United after completing the British record £59m move and says the Red Devils are the only side he would have left Real Madrid for. Angel Di Maria will take the currently unoccupied number seven jersey after completing his £60m move to Manchester United. Paul Smith Britain's most expensive player Angel Di Maria will cost Manchester United a staggering £60m today - a sum that somewhat dwarfs the first transfer fee the 26-year-old commanded: 35 footballs. Manchester United have agreed a £59.7million fee with Real Madrid for Angel Di Maria. Manchester United are looking to have the British record signing of Real Madrid winger Angel Di Maria wrapped up by Tuesday evening, Press Association Sport understands. Martin Hardy Manchester United have agreed a £59.7million fee with Real Madrid for Angel Di Maria this evening, Press Association Sport understands. Dion Fanning THE rehabilitation of Vincent Tan can provide some consolation for Ed Woodward during the dark days Manchester United's executive vice-chairman is currently enduring. Barcelona have failed with an audacious £48m offer to sign Angel Di Maria from arch-rivals Real Madrid, according to reports in Spain. The majority of the transfer attention today is on Merseyside with the imminent arrival of Mario Balotelli, but other Premier League sides are lining up big-money moves. Jamie Holland Manchester United target Angel Di Maria and Arsenal target Sami Khedira have rejected the offer of new contracts at Real Madrid, the Spanish club's coach Carlo Ancelotti revealed yesterday. Jason Burt Whatever happens between now and the transfer window closing on Sept 1 this is not the way it was meant to be at Manchester United. The strategy has failed. Angel Di Maria has told Real Madrid he wants to leave the club and has rejected the offer of a new contract, coach Carlo Ancelotti has revealed. Paul Scholes has expressed fear that Manchester United will descend into long-term decline unless rapid action is taken to strengthen their faltering team. Jim White There is no question who is the most significant figure in the immediate future of Manchester United. It is not Wayne Rooney, it is not Angel Di Maria, it is not even Louis van Gaal. An opening day defeat for Manchester United has intensified their transfer strategy and it now appears that Angel Di Maria is the number one target. Dion Fanning at Old Trafford Louis van Gaal said he couldn't have had a worse start as Manchester United manager after his side were beaten 2-1 at Old Trafford by Swansea City yesterday. Real Madrid coach Carlo Ancelotti has told Louis van Gaal he will find it extremely hard to win the title with Manchester United next season. Simon Rice Angel Di Maria is set to snub Manchester United and move to Paris St Germain. Ed Woodward insists Manchester United are ready and willing to break the British transfer record if new manager Louis van Gaal decides they need to do so. Darragh Collins Spurs boss Mauricio Pochettino has made a £20m bid for Real Sociedad's Antoine Griezmann in an effort to boost the club’s striking options. Louis van Gaal has just returned from the World Cup but he is busier than ever as he tries to rebuild the Manchester United empire. Miguel Delaney Before a knife-edge semi-final in Sao Paulo, one thing is certain: Argentina won’t be going down, or going out, without a fearsome fight. ON Saturday night, in a packed restaurant in Brasilia, a waiter made the mistake of dropping them some plates. Angel Di Maria will miss Argentina's World Cup semi-final against Holland on Wednesday. Darragh Collins Just four teams remain in the 2014 World Cup and Independent.ie has chosen the dream team from the four squads left in the competition. Belgium coach Marc Wilmots labelled Argentina as "ordinary" and criticised their spoiling tactics after his side went out of the World Cup after a 1-0 defeat in the quarter-final in Brasilia. Daniel McDonnell in Brasilia This was not the Lionel Messi show and Argentina can take comfort from that fact after booking their semi-final place in more comfortable fashion than the scoreline suggests. Argentina eased into the World Cup semi-finals as a disappointing Belgium side made a low-key exit from the tournament. Angel Di Maria has not been firing on all cylinders at this World Cup but his late extra time winner sparked euphoria and this Argentinean commentator captured it perfectly. Lionel Messi feared Argentina were about to crash out of the World Cup until Angel Di Maria popped up with an extra-time winner in Sao Paulo. Argentina needed an extra time goal to overcome Switzerland in an extremely tight World Cup last-16 match but coach Alejandro Sabella congratulated his team and said the win was "well- deserved." Argentina squeezed into the quarter-finals of the World Cup thanks to a last-gasp extra-time winner from Angel Di Maria. More than 1,000 fans have been forced to switch seats after stadium building delays and changes to signage compelled a reconfigurement of some seating plans. Jack de Menezes Manchester United are hopeful that they can land Atletico Madrid midfielder Koke in a £48m move that would smash their current transfer record as the Louis van Gaal era begins to take shape. Angel di Maria wants to stay at Real Madrid but admits that the club may want to sell him this summer. Real Madrid top scorer Cristiano Ronaldo is out of today's La Liga match at Celta Vigo. Real Madrid took a step towards their first Champions League final in 12 years by beating Bayern Munich 1-0 at the Bernabeu thanks to a first-half goal by Karim Benzema. Pete Jenson It was a slip of the tongue from Carlo Ancelotti and it revealed almost as much about Wednesday night's meeting between Bayern Munich and Real Madrid as everything else he said. Gareth Bale scored the most important goal of his career to win the Copa del Rey for Real Madrid, netting the decisive goal against fierce rivals Barcelona in the final at the Mestalla. Copa del Rey final: Can Real Madrid beat Barcelona without Cristiano Ronaldo? Real Madrid survived a huge scare to progress through to the Champions League semi-finals as Borussia Dortmund fell just short of a stunning second-leg fightback. The sight of Cristiano Ronaldo limping off near the end of Wednesday's Champions League match will have set alarm bells ringing in his native Portugal. Cristiano Ronaldo looks set to be fined for comments he made after Sunday night’s controversial Clasico win for Barcelona after Spain’s main refereeing body decided to make a complaint to the Spanish Football Association. Barcelona reignited their title challenge with a 4-3 victory over Real Madrid in a pulsating Clasico which had a little bit of everything. Real Madrid took a huge step towards booking their place in the Copa del Rey final by beating out-of-sorts city rivals Atletico Madrid 3-0 at the Bernabeu. Real Madrid coach Carlo Ancelotti says there will be no transfers in or out of the club during the January transfer window amid reported interest from England in fringe players such as Fabio Coentrao and Alvaro Morata. Real Madrid have launched an internal inquiry after their Argentina winger Angel Di Maria was seen to grab his crotch while he was being substituted in Monday's 3-0 La Liga win at home to Celta Vigo. Gareth Bale has been ruled out of Real Madrid's Copa del Rey match against Olimpic Xatvia with a calf problem, but coach Carlo Ancelotti is confident the problem is not serious. Gareth Bale scored his first hat-trick as a Real Madrid player and provided an assist as Carlo Ancelotti's side brushed aside Real Valladolid 4-0 at the Bernabeu on Saturday night. Iain Rogers Real Madrid's Cristiano Ronaldo is out of Wednesday's Champions League Group B match at home to Galatasaray due to a leg muscle strain, coach Carlo Ancelotti has revealed. COACH Carlo Ancelotti has called for patience as Real Madrid fans wait to see the best of Gareth Bale following his record-breaking summer move to the Bernabeu. Sid Lowe It was Neymar Santos Junior who took the Barcelona-Real Madrid rivalry into a new era, while Gareth Bale will have to await his chance to make an impact on the greatest game in club football. Goals from Neymar and Alexis Sanchez gave Barcelona victory over Real Madrid in the Clasico at the Nou Camp, sending them six points clear of their fierce rivals at the top of the Primera Division. His triumphant unveiling at the Bernabeu last month must feel like a distant memory for Gareth Bale as he has already become a figure of derision in the Spanish media.